You should get these for free from your butchers, yay! Garden herbs – Parsley, sage, rosemary and thyme of course…. Place the carcasses, roughly chopped vegetables and cloves of garlic on an oven tray and bake until golden brown in colour in about 175 degrees. Once done, transfer them to a big pot and cover with water. Bring to boil and simmer for two hours with a lid on. Remember to add the rest of the ingredients as well! With the lid the idea is not to let the water evaporate too much but to get that intense flavour a stock should have. When done, pour through a big sieve. 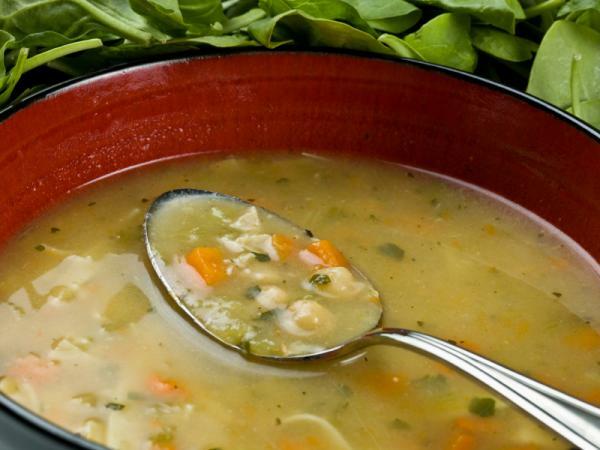 Recover all the succulent meat and discard the bones, skin and cartilage. If you want your stock to be more soupy, like I love it, pass the rest of the mixture of vegetables and herbs through the sieve so you get a nice smooth mash you can mix in with the stock later. As for now, let the stock rest and cool down. You’ll notice that the fat will settle on the top and if you put it in a cool place for a while it will solidify on the surface. Then it is easy to peel off and discard. Once you’ve taken the fat off you can mix the mash and meat off the bone to it and either enjoy the whole 2l of soupy stock or make smaller portions and freeze them for later. It is perfect food when coming home and not having time or energy to cook. Put a portion in a pot, let it melt on a fire, enjoy like that or even add rice or pasta, some olive oil and parmesan cheese… yum yum. I’ve said it all. P.s. I also use it as a base for Tom Kha, the Thai soup I love the most.